It's almost a month into the rehearsals for the Edmonton Opera Chorus's production of "Tales of Hoffman." It's been a gradual evolution from choir girl to opera girl but I feel like I'm slowly entering into a world of vocal opulence. In rehearsals, I'm enveloped by rich, vibrato-filled voices singing the sweeping lines of Offenbach and the effervescent energy of French opera. I definitely miss the subtley of vocal colours that I'm used to in Pro Coro, but there are many new experiences I am eager to embrace in this Opera Chorus process. 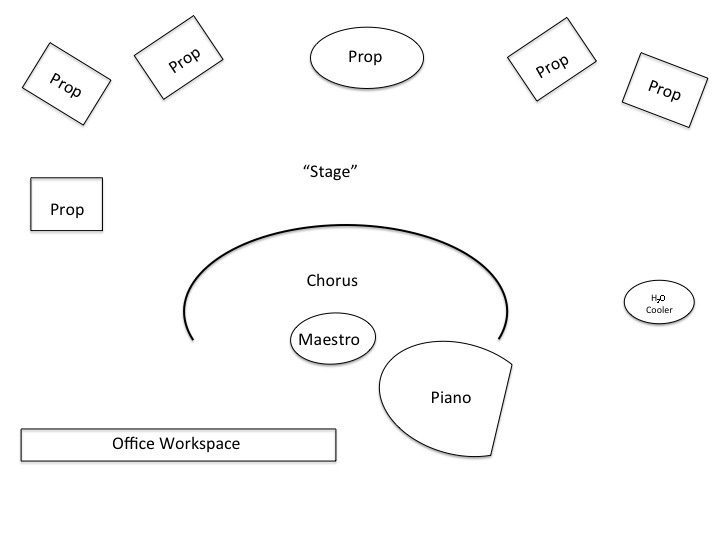 One thing is just witnessing the hierarchy of preparation for a large Opera production. Never before have I had costumes tailored to fit me or have somebody style my hair with synthetic additions. I think it'll be the closest I will ever come to feeling like a model. Upon entering the Edmonton Opera production facility, I saw rows of long work tables tables laden with fabric, accessories, and sewing materials. The first thing I was offered was a range of footwear in my size to try on. They even had a small square sample of the stage floor so I could check to see if there was adequate friction on the stage to feel comfortable wearing heels. After finding two suitable shoe options, I proceeded to the change room to see both of my costumes laid out for me with accompanying accessories. I tried each one on in turn, impressed, but slightly wary at the same time. They chose, tailored, or made the clothing to closely match my initial measurements taken at the start of the season. Since this was the case, it made me realize that I could not gain any weight over the holidays. I walked out the change room and a team of women adjusted accessories, discussed rolling or unrolling my sleeves, and tugged and tweaked my costume until it met their aesthetic level. Afterwards, the hairstylists pincurled my hair in order to get accurate head measurements for future wig reference; however, for this production, they just decided on a small hair attachment to form my low chignon. Our first rehearsals were spent working with chorus master, Michael Spassov, who ensured notes, dynamics, text and other overt details of the piece were solidified for the Maestro. This week the Maestro, Christoph Campestrini, arrives to contribute his own artistic voice in the music. We meet with Director, Joel Ivany, later in the week to begin the staging process and occupy the physical realm in which we present the music. I've been able to witness the transformation of the Jubilee Rehearsal Hall from an audition room into an opera rehearsal space. Initially, it was a bare room with only Spassov and the Edmonton Opera CEO, Sandra Gajic, listening to my audition. Now it has been transformed into the heart of the Edmonton Opera rehearsal space. 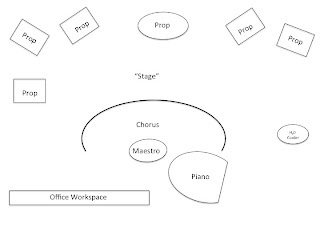 There is a office workspace area set up at the front, a rehearsal area with chairs for the chorus and piano, behind this is the floor-taped outline of the Jubilee stage with larger props pieces scattered along the back edges of the room, artist stage illustrations and photo inspiration for this dustbowl circus production form a collage on a portion of the wall. There is even a water cooler. If that doesn't symbolize a work space, I don't know what does. 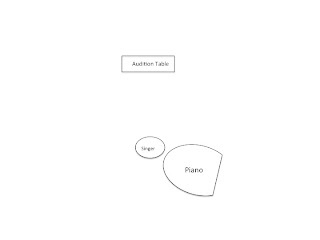 The music rehearsal process is the most familiar to choral realm to me. I am attempting to maintain my tuning fork use from Pro Coro while in the Opera Chorus to maintain a level of a cappella independence. Spassov makes the evening rehearsals engaging with his ability to create lush metaphors, always providing context for where we are in the piece, and accurate vocal models of what he expects from the chorus. Spassov is challenging us in terms of tempo and dynamics in order to make sure we're pliable and able to accommodate the preferences of the Maestro. He also somehow manages to comedically paraphrase portions of the opera, such at the moment when Hoffman falls in love with the mechanical doll, Olympia. The chorus laughed at the ridiculousness of the situation. Spassov looked pensive at this moment, he glanced up at the ceiling to compose his thoughts, and empathized how there are moments like this in real life. At first, a person can look so ordinarily human... until you realize you can do little to change their pre-programmed routine or warm their emotionless demeanor. It is at this point where you realize: "Holy $*^! I'm in love with a robot!" 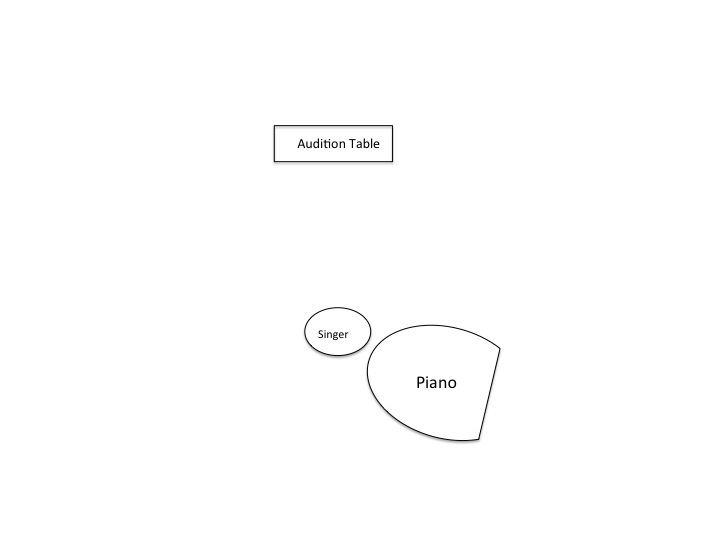 Thus far, the Opera Chorus rehearsal process has been in familiar territory for me. 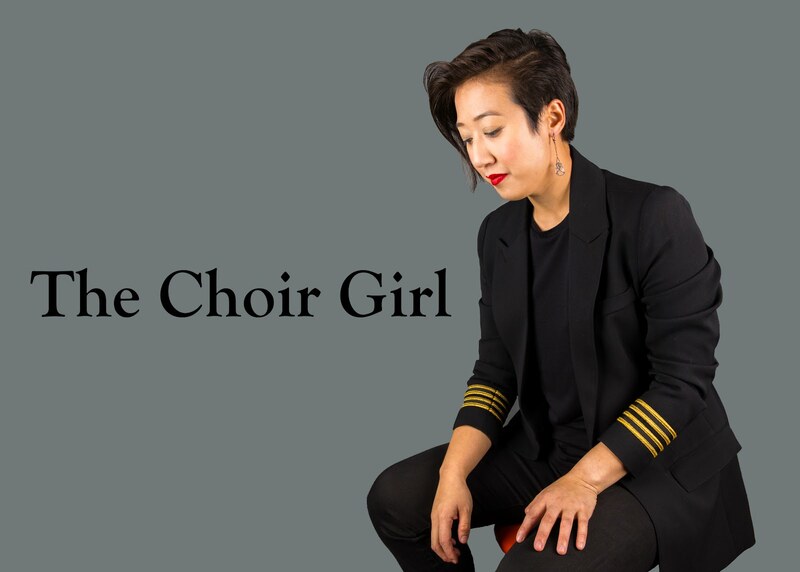 However, I'm sure once staging gets started this upcoming week, I'm going to be shaken out of my comfortable choir girl boundaries as I will be given the opportunity to embrace a more dramatic side of my performance persona. I look forward to it.